I’ve got another Max Lucado quote for you. “Oversize and rude, fear is unwilling to share the heart with happiness. Happiness complies and leaves. Do you ever see the two together? Can one be happy and afraid at the same time? Clear thinking and afraid? Confident and afraid? Merciful and afraid? No. Fear is the big bully in the high school hallway: brash, loud, and unproductive. For all the noise fear makes and room it takes, fear does little good. “Fear never wrote a symphony or poem, negotiated a peace treaty, or cured a disease. Fear never pulled a family out of poverty or a country out of bigotry. Fear never saved a marriage or a business. Courage did that. Faith did that.” –Max Lucado, Fearless. To pull a family out of poverty or save a marriage or business you have to be in a vulnerable position. You have to make those brave and scary decisions to transition the situation to one of hope. You may think your fear of one of these crises will keep you out of this pain. The truth is fear does not keep you safe and prevent bad things from happening. Your bravery comes when you embrace vulnerability. Vulnerability. Does that word cause some emotions in you? Maybe negative emotions? Remember that feeling a feeling is not weakness. Feelings mean you are alive. Fear is used to numb these feelings and that is not living. My #2 influencer, Dr. Brene’ Brown said this, “Vulnerability is not weakness; it’s our greatest measure of courage.” Rising Strong, p. 4. Amen to that. This quote shapes my life. Before I go on and really get preachy, I’d like to clarify a truth about vulnerability. (Yes, I learned this from my Dr. Brene’ Brown stalking.) 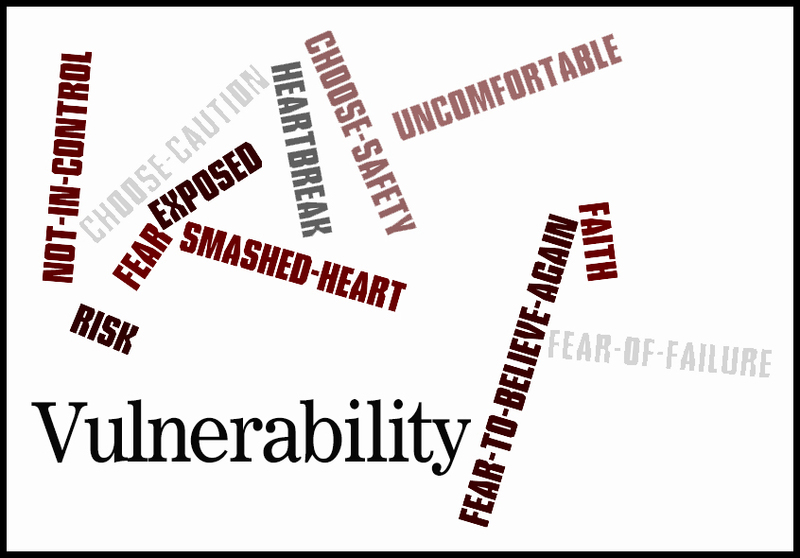 In the Merriam-Webster Dictionary, the word vulnerability is derived from the Latin word vulnerare, which means “to wound.” This also means “capable of being wounded.” This is what we don’t like about vulnerability yet it is part of the very root. There is more. In the Merriam-Webster Dictionary, the word weakness is defined as the “the inability to withstand attack or wounding.” Vulnerability is based in strength because we are putting ourselves out there. Weakness is the lack of vulnerability thus the lack of strength because fear won’t let us get wounded. Making yourself vulnerable is considered a form of weakness to many but it is really a measure of courage because we believe we are worthy enough to put ourselves out there. What words can you add to this word list? None of these words are inviting. All of them are uncomfortable. But this is where symphonies are written. Where great stories are told. Are you living a great story? In all this challenging bravado I’m giving you, know this too. You need at least one small safe space to work through your fears and falls. Do you have this place? This relationship? This small group? This team? You must have this in your life to live with bravery. Find this safe place. Shame thrives in secrecy. Shame will not hold you back when you can share it in your safe place. 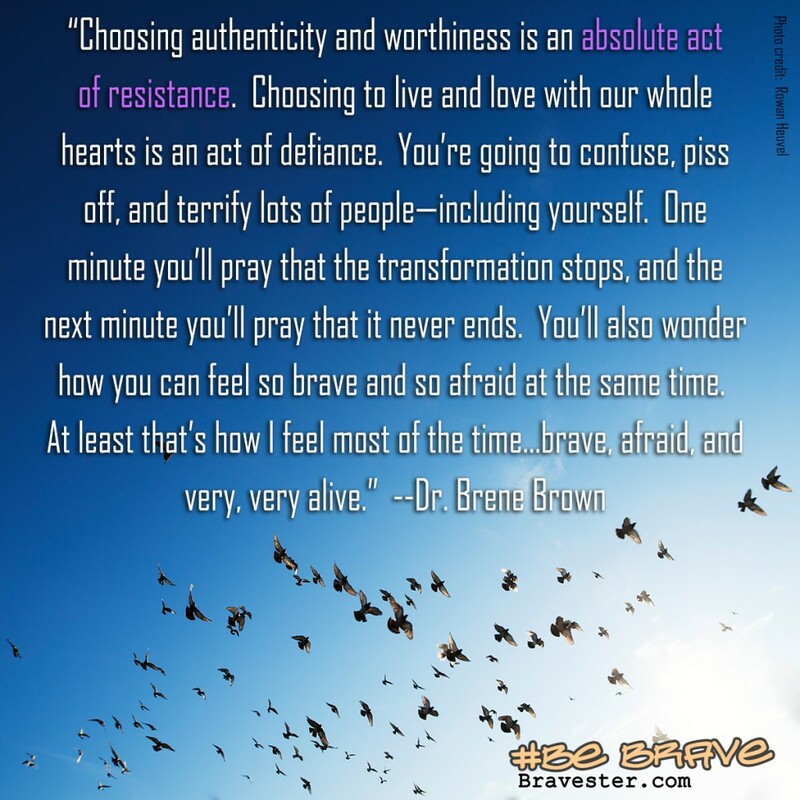 “Choosing authenticity and worthiness is an absolute act of resistance. Choosing to live and love with our whole hearts is an act of defiance. You’re going to confuse, piss off, and terrify lots of people—including yourself. One minute you’ll pray that the transformation stops, and the next minute you’ll pray that it never ends. You’ll also wonder how you can feel so brave and so afraid at the same time. At least that’s how I feel most of the time…brave, afraid, and very, very alive.” –Dr. Brene Brown, The Gifts of Imperfection: Let Go of Who You Think You’re Supposed to Be and Embrace Who You Are.